From the “fiscally responsible” Commissioner, Joey Williams? On the campaign trail, Commissioner Williams talks about how he brought fiscal responsibility to City Hall under his watch. Sure, that’s why the city spent over $4 million first declaring part of Twin Towers blighted, then paying for appraisals, options and buildings in a 12 acre parcel over 5 years of his watch- with no contract from either the developer or Kroger for them to take possession of the parcel or to build a new Kroger. But, now, we’re going after Matt Luongo. Who? The guy that actually delivered something- a music festival in Downtown Dayton that bombed financially- but, was a pretty good freshman shot at doing something positive in the city. DAYTON, Ohio (WDTN) – It was supposed to put Dayton in the national spotlight and generate millions for the city. Instead, it’s left some people singing the blues and chanting “show us the money.” Even taxpayers are out for now. 2 NEWS Investigates obtained a letter in which the president of the limited liability company set up to put on the music festival, “Downtown Revival” reports more than a $200,000 loss and little hope to pay those he owes…. The trail of unpaid services doesn’t stop there. 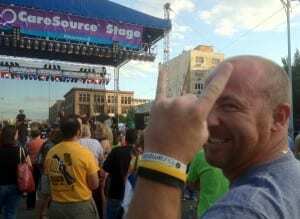 2 NEWS Investigates found out your tax dollars ended up supporting what was to be a privately funded event. That’s because Downtown Revival, LLC hasn’t paid the City of Dayton either, and the city leaders who agreed to a contract with the company don’t seem to know where your money is. When Mayor Gary Leitzell’s assistant told us he wouldn’t be talking about it, we approached the mayor at City Hall. He said he’d talk with us when he looked at the details. A week later, there was still no word from the mayor. City Commissioner Nan Whaley did agree to an interview. “We’ll certainly try to recoup the money paid to the city for those efforts. We recognize, too, that Matt’s trying to do something, trying to support that effort but we’ll go after the money as well,” she told 2 NEWS. The money amounts to more than $60,000 for help from police, fire, and public works. Our public records request produced only one check to the City of Dayton, that being for $10,000 dated September 7, 2012. The City’s public information officer was reluctant to comment. Pam Elliot : So is it in the legal department now? Tom Biedenharn: No. It doesn’t necessarily have to go to the legal department. Elliot: So what is the process? Biedenharn: We work with the vendor. Elliot: Is Matt Luongo or Downtown Revival, LLC coming forward with money? Biedenharn: We are working with him. Elliot: Are you confident you’ll get the money? The letter directs them to take their questions to Tom Whalen, attorney for Downtown Revival. We did, but got no answers…. The city says the city manager’s office has been in conversations with Luongo to work out repayment, but if that doesn’t work, they’ll send the matter to the Finance Department’s collection program. via Big dollars owed City and vendors | 2 NEWS Investigates. For those who have no clue how Luongo got to do what he did, you might want to look at where he worked previous to his turn in the sun at the community’s expense. His father, former CEO of the Berry Company, opened doors for him- at the Dayton Development Coalition and then UD. Somehow, someone looked past the facts that he had no experience in concert promotion, wasn’t signing for anything personally, and had no personal assets on the line. That’s fiscal responsibility Dayton Style, thanks to Commissioner Williams. As to Ms. Whaley, a local businessman told me she had no clue what an LLC was. Well, maybe now she does. But seriously, folks, $200K is about what we pay Steve Budd at Citywide a year, it’s about what the Dayton Development Coalition spent on their annual meeting a few years ago where they brought in a Las Vegas artist to do a painting of John Lennon while spinning the canvas and giving away t-shirts in plastic tubes. This is small fry theft, but I’m sure Matt Luongo will be hung out the way Raleigh Trammell was too- while letting the big crooks walk. Previous Post: Is Dayton a city of peace? A beacon to welcome all? How are there costs related to police and fire ? Unless this event asked for special coverage by them, I don’t think the costs involved should be charged. The public works part, I can understand – they likely req’d manpower to set up barricades before and after the event. Of course, isn’t a permit for an event like this required and along with that permit, a fee to cover those costs ? @Hall- we paid a lot of overtime for extra cops, fire that were required by the city. Closing streets, etc. Plus cleanup- etc. A contract is only as good as the parties involved. If the contract / permit requires some level of police / fire support, I understand. It’s not clear if that was the case though. If the fire dept sent an EMT crew there or the police sent a couple patrol cars there, “just in case”, that’s not the event’s responsibility. Yes Hall, he was required to staff city police and fire on site. Also city inspectors for electrical hookups etc. Most of them stood around and enjoyed the shows. And the city did get a deposit, there was just no way to guarantee the rest, the company was a shell. And- I’ve been remiss. To blame Williams for this is wrong. It takes three votes to approve the City Manager’s recommendations. The City Manager either was involved in these negotiations, or someone on staff was. The question is will anyone in city hall be held responsible? Will anyone ask Pam Elliot to look into that question too, David E? City of Dayton needs to concentrate on the basics. Things like law enforcement, infrastructure, dealing with abandoned properties, and education. Concert promotion is a lot sexier than, say, running a fair and efficient building inspection program. But it’s a business where even seasoned professionals sometimes lose their shirt. It’s high risk. City of Dayton placed tax dollars at risk. In effect, they fronted money to Matt Luongo. The city officials that approved this are not concert promotion professionals, and were unable to assess the risk. Everybody involved (public and private) had the best of intentions, and should be commended for trying to do something positive for the community. The City of Dayton, however, needs to stick to the basics, and focus on their core business. Leave concert promotion to private enterprise, somebody with lots of experience and deep pockets. One more thing: When dealing with concert promoters, ALWAYS get paid up front. Thus endeth the lesson. @Dave C. I’m in total agreement with stick to the basics. We’ve played concert promoter before- through the department of parks and rec- at Island park and lost our @$$. I believe part of the reason Matt was able to pull it off was because he said he had the support of the City- and people thought that meant someone had really reviewed his financials etc. As a golden child of the Dayton Development Coalition, he had an instant door opener- since they are above reproach or investigation. I’m sure there were others that lost money- and I believe that Prime Time and the Stage hands should be made whole. As to SheilaO- Pam Elliot knows about other things- like the IRG/Emery deal and won’t touch it. But- maybe, given more positive feedback for breaking this story- we’ll see her dig a little deeper. Wait….what’s that? There….there it is again. Why, I think it’s…it’s the faint, lingering aroma of INVENTING FLIGHT! The Bottom line is city’s were invented to take on the everyday responsibility to maintain the basic tasks of making sure our streets our maintained the water flows through pipes to the people . Our city’s were only intended handle day to day operations for the well being of its community. If you want to see a concert go to the Fraze, If you want to get a reporter to do a story properly it wont happen, The reason our housing market is in the tank is because of to much city and federal government trying to regulate things they know nothing about . The private sector and small business get things done far more efficient ,cheaper and on time. Do the math or ask the question how many jobs were created by the concert from outside our region NONE, and how many people from outside the region came and thought i would like to move to Dayton its a happening place NONE. Matt didn’t need a business plan our the credentials of rock GOD promoter because Nan , Joey,Matt, and Dean if he was present voted without reading the business plan because they don’t care. I presented a plan for the Emery site with Iron clad financials ask the city for NO money No risk and funded it without a single bank involved sorry Joey no commission for the bank. Instead they gave it to a guy with a plan written on two pieces of paper of one which the city wrote for them . And as far as Inventing Flight the Wright bros did this . And the city invented Suburban Flight get out as fast as you can! @Dave C makes a well deserved point- we blew a lot more on “Inventing Flight” and people didn’t get paid or punished either- except maybe DDN publisher Brad Tilson, who was first banished to run DAI for a while- then left town. Well since I own one of the businesses that Matt Luongo owes money to, ($21,000) for the t-shirts we printed for the event, Im gonna have to say he should be held responsible for it. He knowningly spent $ he knew he wouldn’t be able to cover and straight to my face on several occasions. Also a friend of mine saw him blowing money at a casino a few months later so he is a crook in my eyes and should be punished for it. My business is small and a hit like that, we are still trying to get out from under. It’s not right. @Shannon- I’m sorry that your small business was screwed on this. It’s not right. Unfortunately- even after winning a case against a business in small claims court- there isn’t a lot of help in collecting. Increasingly – being a small business owner isn’t as much fun as it used to be. No tax breaks. No relocation assistance. No protection from scumbags. More and more filings- and reporting. More rules.